Trump Administration Tightens Up On Cuba – How Does It Affect Cruises? I just listened to President Trump’s speech regarding U.S. policy with Cuba. He said he was cancelling the Obama Administration’s ‘bad deal’ during a speech filled with tough words about the Castro regime. Of course much of the passionate speech was for the benefit of the crowd, which was mostly Cuban-Americans who have borne a heavy human and financial burden in many cases, and who also helped deliver Florida to Trump in the election. But it also was a clear message to the Cuban government. The speech didn’t provide any specifics on how travel will be affected. Many of the details were already provided to the media Thursday, and the new rules still have to be written and approved. The federal agencies have 90 days to do that, so cruises in the near term should not see any changes. The Cuba FAQ on the U.S. Treasury website indicate that there will be no immediate changes for U.S. citizens, and in fact if they have booked part of a Cuba trip prior to today, they will be covered by existing rules and not the new ones if their trip occurs after the new rules take effect. The one thing few are talking about is how will Cuba respond? I have to say that the rhetoric used by the President was not exactly cordial and I doubt the Cuban government was smiling after hearing it. But will they respond in kind? That remains to be seen. As it exists now, cruise passengers can self-certify that they did legal things while in Cuba from a list of 12 approved activities. They don’t need to take an organized tour through the cruise line or with a tour operator. However, going forward that could change. The Trump Administration wants to end individual travel to Cuba that is not tightly controlled, and that could very well cause the cruise lines to require all guests to have an approved tour of the minimum legal length (5 to 8 hours per day depending on how long the ship is in port), or they won’t be allowed off the ship. Guests may have to start keeping a log of their shore activities, keep tour documentation and be prepared for a more in-depth interview by Customs upon their return to the U.S. Currently, Customs has been treating visitors to Cuba no different than those going to other Caribbean nations. The Treasury Department could audit the records of any U.S. citizen who visits Cuba, and they have 5 years in which to do it so visitors will need to keep all their records for that period of time. That rule exists now and won’t be new. We’ll be waiting for the other shoe to drop. Carnival Cruise Line has announced the appointment of the senior officers for its newest ship, the 133,500-ton Carnival Horizon, which is currently under construction at the Fincantieri shipyard in Italy and set to debut in spring 2018. Captain Luigi De Angelis – A 22-year veteran of Carnival Cruise Line, De Angelis joined the company as a deck cadet aboard the Carnival Imagination in 1995 and was named captain in 2010. During his Carnival career, De Angelis has been part of the start-up teams of five ships and most recently served as master of the line’s newest ship, Carnival Vista, during its inaugural season in Miami. Chief Engineer Rosario Capilli – Capilli joined Carnival in 1990 following a career in the tanker and cargo industries in his native Italy. He was named chief engineer in 2002 and has served in this capacity on a number of Carnival ships, including Carnival Vista during its inaugural season. During his 27-year Carnival career, Capilli has served on the start-up teams for three Carnival ships. Hotel Director Pierre B. Camilleri – Now in his 13th year with Carnival, Camilleri joined the company as hotel director after managing hotel and resort properties in his native Malta, as well as North Africa, Italy and China. He has served as hotel director on several Carnival ships and traveled to Italy to be a part of the inaugural teams for the line’s two most recent newbuilds – Carnival Breeze and Carnival Vista. These talented professionals will lead a team of nearly 1,400 dedicated employees who will travel to Marghera, Italy, to prepare the ship for its April 2, 2018 maiden voyage – a 13-day Mediterranean cruise from Barcelona. Carnival Horizon will also operate two seven-day Mediterranean cruises from Barcelona departing April 15 and 22, 2018, and a 10-day Mediterranean cruise departing April 29, 2018, before repositioning to the U.S. with a 14-day trans-Atlantic crossing from Barcelona to New York May 9-23, 2018. Carnival Horizon will then operate a summer schedule of four-day Bermuda and eight-day Caribbean departures from the Big Apple before shifting to Miami to launch year-round six- and eight-day Caribbean cruises beginning Sept. 22, 2018. Carnival Horizon will also offer a special two-day cruise to Nassau from Miami Sept. 20-22, 2018. 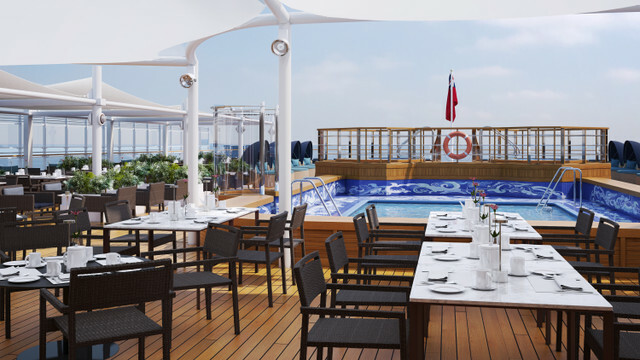 Carnival Horizon will offer a wide range of onboard activities, including the popular bike-ride-in-the-sky attraction called SkyRide, an IMAX Theatre, and a vast array of dining choices, including the Fahrenheit 555 steakhouse, Bonsai Sushi, the Cucina del Capitano family-style Italian restaurant and Ji Ji Asian Kitchen. Carnival Horizon will also be the first ship to feature a colorful Dr. Seuss-themed WaterWorks park – part of an exclusive partnership with Dr. Seuss Enterprises. Cunard’s Queen Victoria made her return to Southampton yesterday, showing off an array of new features following an extensive $40 million refurbishment. First-look photography was released today. 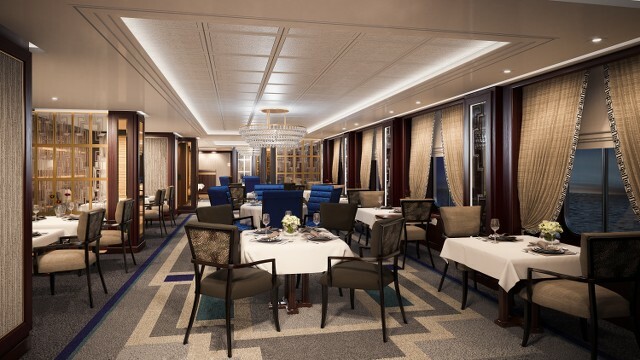 Exquisite interior design takes center stage in the new Britannia Club Restaurant and continues within the 43 new Britannia Club staterooms. 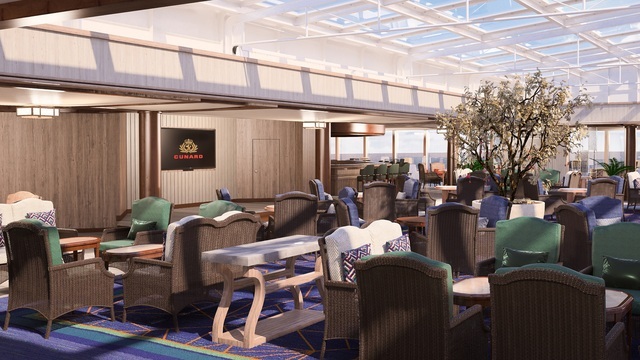 Further enhancements on board include refined and redesigned Grand and Penthouse Suites, as well as a new sun deck and an enhanced Winter Garden. Every stateroom has been refreshed, including the installation of large flat screen TVs and much requested tea and coffee brewing set ups. AFT LIDO SUN DECK: This lounge space has been extended to provide guests with additional deck space and access to the rays from sunrise to sunset. Windbreakers and additional sun loungers and luxury cabanas have also been introduced to accommodate sunseekers on board, while the shaded area has been extended for those looking to dine al fresco. Full beverage service is also available throughout the day and into the evening to enjoy alongside live entertainment. WINTER GARDEN: A beautiful room for relaxation located in the heart of deck 9. Guests can sip their favorite beverage on the elegant lounge furniture while looking out through the floor to ceiling windows at the view. In addition, the comfort and décor has been further refined, with a statement floor and glass canopy. 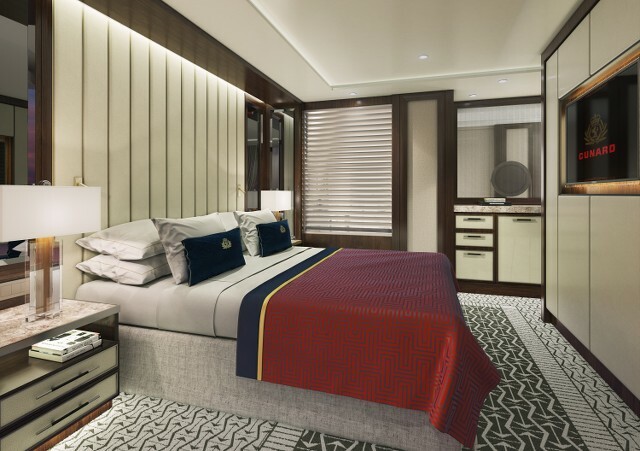 BRITANNIA CLUB STATEROOMS: In a prime mid-ship location on decks 7 and 8, all staterooms have been upgraded and refreshed with newly-designed carpets featuring a contemporary geometric design as well as the addition of new soft furnishings. New flat screen TVs and, by popular request, tea and coffee making facilities, have also been added to upgrade the stateroom experience even further. 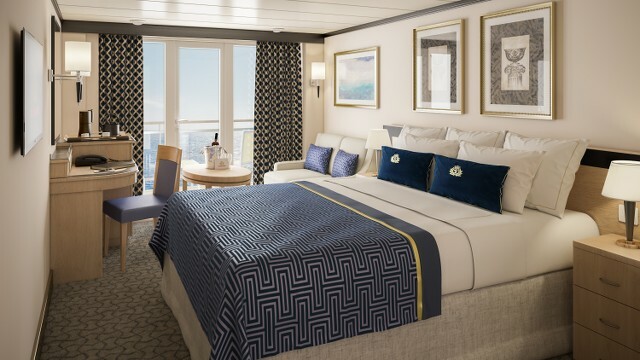 The additional 43 balcony staterooms will be further enhanced with premium balconies and a nine-pillow concierge menu to ensure maximum comfort for guests on board. BRITANNIA CLUB DINING: The new Britannia Club restaurant has gone through a full interior re-design and will offer guests the flexibility to dine whenever they choose. 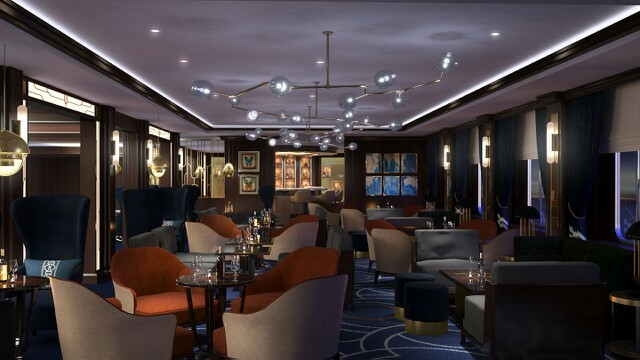 Located in the space of the former Chart Room, the new restaurant resides alongside the main Britannia restaurant on Deck 2. PENTHOUSE SUITES: Five of Queen Victoria’s elegant Penthouse Suites have been completely redesigned to maximize space and luxury, and raise the quality of guests’ experience even further. The new suites feature floor to ceiling windows and doors, private balcony with stunning sea views, additional storage space and beautiful bathrooms with luxurious whirlpool baths. With butlers and concierge on hand to take care of every need, the luxurious suites are among the finest accommodation available at sea. 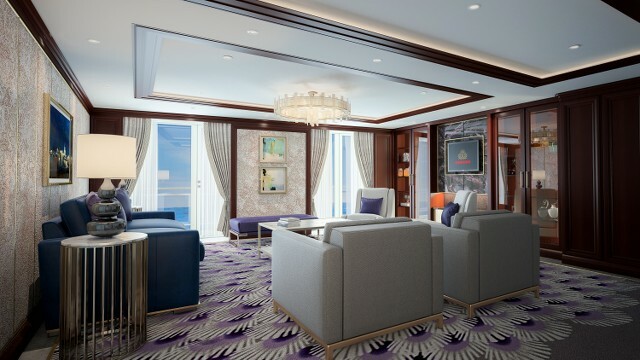 GRAND SUITES: The Aquitania, Berengaria, Mauretania and Laconia Suites have been redesigned to maximize space, with similar square footage to those on Queen Elizabeth at approximately 1,436 sq.ft. Mirroring a luxurious residential apartment, refreshed designs include floor-to-ceiling windows and doors, a separate snug room with TV, beautiful lounge, master bathroom with sea views and dual aspect balcony, as well as a second bathroom and walk-in wardrobe, providing guests with supreme luxury and comfort whilst on board. CHART ROOM: A new concept introduced as part of the Queen Victoria refit, the Chart Room is located just off the Grand Lobby and will provide guests with illy coffee, Godiva chocolate treats and light bites by day, before transforming into a cocktail lounge by night. The newest member of Royal Caribbean International’s Oasis class of ships, Symphony of the Seas, is now one step closer to full completion as her April 2018 debut approaches. With the exterior now complete, Symphony of the Seas was floated out of dry dock to begin the next phase of interior construction. Symphony of the Seas will spend her inaugural summer season in the Mediterranean calling on ports in Barcelona and Palma de Mallorca, Spain; Provence, France; Florence/Pisa, Rome and Naples, Italy. The ship will then arrive to Miami in early November 2018 to begin 7-night Eastern and Western Caribbean itineraries. Just as each of her sisters did in small increments, Symphony of the Seas will claim the title of the world’s largest cruise ship, offering 28 more staterooms than Harmony of the Seas and encompassing 230,000 gross registered tons. Along with new features and amenities for guests, Symphony also will boast all the innovations and experiences of Harmony of the Seas. Among these are the seven-neighborhood concept, a vast array of dining options, Bionic Bar robot bartenders powered by Makr Shakr, Broadway-caliber entertainment, the iconic waterfront AquaTheater, the Perfect Storm trio of waterslides, and Ultimate Abyss – the tallest slide at sea. Carnival Cruise Line has launched a new program called Carnival EasyPay that allows guests to pay for their cruise in three monthly installments. Guests make their initial cruise deposit and then the balance of their cruise is charged in three equal payments which are taken out automatically on the same designated day for three consecutive months. Guests can either register for the program at carnival.com or via the line’s call centers. Travel agents can also sign up for Carnival EasyPay to process payments on behalf of their clients. Essentially, it automates what you would otherwise have to do on your own. Guests must make a required deposit on their cruise fare to be eligible for Carnival EasyPay. Additionally, the deposit due date must be at least 90 days before the final payment date. The first installment is charged to guests’ credit card 30 days from the date of the deposit with two additional monthly installments thereafter. While Carnival EasyPay is available at no cost, guests are responsible for any interest charges by their credit card provider. Guests are prompted to select Carnival EasyPay in the “How Would You Like to Pay” section of carnival.com when ready to make payment on their booking. Guests can also sign up for or cancel Carnival EasyPay after the initial deposit is made by visiting the “Manage My Booking” tab on carnival.com. Additional information on Carnival EasyPay is available at https://www.carnival.com/carnival-easy-pay. A video outlining the program can be viewed here. Norwegian’s Free at Sea promotion provides guests who book a new three-day or longer sailing in an oceanview, balcony or mini suite category stateroom with the opportunity to select their preference of two free choices from five onboard amenity offers**, including free unlimited open bar, free Specialty Dining, $50 towards shore excursions in each port per stateroom, 250 minutes of free WiFi, or Norwegian’s Friends & Family Sail Free offer that allows the third and fourth guests to sail for free on many 2017 and 2018 sail dates. Inside staterooms, as well as Norwegian’s Studio staterooms for solo travelers, can choose one free offer. Guests that book a cruise in a suite or The Haven by Norwegian® and enjoy all five free amenities**, providing up to $2,500 in added value to their cruise. Guests looking to experience Hawaii on Pride of America can enjoy an exclusive Free at Sea Hawaii offer. Guests who book a new cruise aboard Pride of America now through June 30 have the freedom to select one of five*** offers, including a free one-night pre-cruise hotel stay^ with an option to select reduced airfare starting at $399 from select gateways, a free Specialty Dining Package**, free pre-paid service charges for the first and second guest in the stateroom, free $50 per port shore excursion credit per stateroom, or Norwegian’s Friends & Family Sail Free, allowing the third and fourth guests in each stateroom to sail for free on many 2017 and 2018 sail dates. Guests who book a suite aboard Pride of America can enjoy all five offers. Those looking to experience the charm and magic of the holiday season at sea can enjoy even more onboard splendor with Norwegian’s Holiday Bonus Bundle^*, available now through June 30, which offers $100 of onboard credit on select holiday sailings over the Thanksgiving, Christmas and New Year’s holidays. This credit is combinable with Free At Sea and Free At Sea Hawaii and is perfect for purchasing last-minute holiday gifts in one of Norwegian’s onboard boutiques or to toast to the New Year with a relaxing and indulgent spa treatment. †All sailings 3 nights or longer. Offer is not applicable to categories IX, OX, BX, MX. Norwegian Sky, Norwegian Joy and Pride of America sailings are not eligible for this offer. Friends & Family sail free applicable only on select sail dates. †*Offer valid on 5+ night sailings. Amount of onboard credit is per stateroom and varies by stateroom category. Offer not applicable to categories BX or MX. Offer is not applicable to Norwegian Joy sailings. *Haven & Suite categories are not applicable for this offer. Offer is only applicable for mini-suites and below. Offer available for new bookings made more than 90 days from sail date. **Guests are responsible for an 18% gratuity for retail value for Specialty Dining Package, Unlimited Beverage Package, and/ or the Soda Package, with pricing based on number of cruise nights. Number of meals for specialty dining package based on length of itinerary. $50 USD per port shore excursion credit is per stateroom and is applicable for each port; it is not transferable to other ports. Overnight stays count as one port, except Bermuda sailings which can receive up to 3 individual days of shore excursion credit. Wifi package offers one login per stateroom. On Norwegian Breakaway, stateroom receives an internet package of 250 minutes or 1000 MB of data. ^Cruises must be booked more than 30 days prior sailing, when selecting hotel option; if choosing hotel option with air option cruises must be made more than 60 days prior to sailing. Offer valid for Waikiki Marriott Resort-city view room. In the event that the hotel scheduled to be used in package is unavailable, for any reason, Norwegian Cruise Line reserves the right to substitute the hotel included in package. One night pre-hotel offer is available on reservations with 4 guests or less. If choosing 1 night pre hotel option, reservation must be made more than 30 days prior to sailing. ^* Offer not applicable to categories IX, OX, BX, or, MX. Azamara Club Cruises latest offer– the Nights On Us promotion – started today and provides travelers complimentary nights for voyages in 2018. If travelers book 12+ months out, they’ll receive even more savings by being able to combine this promo with Azamara’s Early Booking Bonus. Offer applies to new bookings made 1-June through 31-August, 2017 (“Offer Period”) on select sailings departing 4-January 2018 through 14-December 2018. Offer not valid for the following sailings: For Azamara Journey: 21-Jan-18, 22-Feb 18, 24-Nov 18, 4-Dec 18, 21-Dec 18. For Azamara Quest: 20-Feb 18, 9-Mar 18, 19-Mar 18, 28-Mar 18, 24-May 18, 22-Dec 18. “NIGHTS ON US” issued only in the form of a savings applied to the total stateroom cruise fare. Savings based on number of cruise nights: 9 nights or shorter cruises- 2 nights on us, 10 to 14 night cruises- 3 nights on us, 15 to 19 night cruises- 4 nights on us. The savings amount for each night on us is calculated by dividing the total stateroom cruise fare by the number of cruise nights. Savings is deducted from cruise fare at time of booking. All other charges, including, but not limited to, cruise taxes, fees, and port expenses, are additional and apply to all guests. Offer applies to new, individual bookings and non-contracted group bookings named and fully deposited during the Offer Period; excludes charters. Offer is combinable with reduced single supplement rates, back to back savings, onboard booking savings, Le Club Voyage quarterly savings. Offer is not combinable with Interline, Travel Agent, and Net Rates, savings, Employee or other Deep Discount rates. Offer is subject to availability and change without notice and may be withdrawn at any time, and is open to residents of U.S. and Canada. Azamara reserves the right to correct any errors, inaccuracies or omissions and to change or update fares, fees and surcharges at any time without prior notice. Refer to AzamaraClubCruises.com/NightsOnUs for additional terms and conditions. The “Great American Eclipse,” is already booking up hotels across the country, and Royal Caribbean International is featuring the event on a 7-night Caribbean sailing on Oasis of the Seas. The ship will cruise to the optimal spot at sea for guests to witness the total solar eclipse on Aug. 21, 2017. The Total Eclipse Cruise will feature a bucket-list-worthy viewing party with a live concert performed by a major headliner – to be revealed at a later date – to celebrate the celestial phenomenon. Guests will be treated to a full slate of eclipse-themed activities, including dance parties, trivia, enrichment lectures, interactive science fun for kids, and cocktails and dishes with names like the Cosmic Cosmo, Planetary Punch and Moon Pie. The 7-night Total Eclipse Cruise will set sail on Aug. 20, 2017 from Orlando (Port Canaveral), Florida and visit Eastern Caribbean destinations: Phillipsburg, St. Maarten; Charlotte Amalie, St. Thomas; and Nassau, Bahamas. You can learn more and book now to witness this historic event at sea by visiting RoyalCaribbean.com/TotalEclipse, calling (800) ROYAL- CARIBBEAN or by contacting your travel agent. Seven other Royal Caribbean ships will be in the Caribbean during the total solar eclipse on Aug. 21, on itineraries ranging from 3 to 9 nights, offering guests partial views of the event. The seven ships are Allure of the Seas, Anthem of the Seas, Empress of the Seas, Enchantment of the Seas, Grandeur of the Seas, Harmony of the Seas and Majesty of the Seas.